Records were donated between 1988 and 2010 by various individuals to the ACWC archives. Individual donations were not retained together, and information on donation provenance was not recorded. The materials were transferred to The Banff Centre Archives in 2011 as part of the records of the ACWC. During processing in 2014, the project archivist separated these records from the organizational records of the ACWC. The collection consists of records aquired by the Association of Canadian Women Composers archives. The materials, which include musical scores and sheet music, concert programs and flyers, media clippings, and sound recordings, were donated by ACWC members. 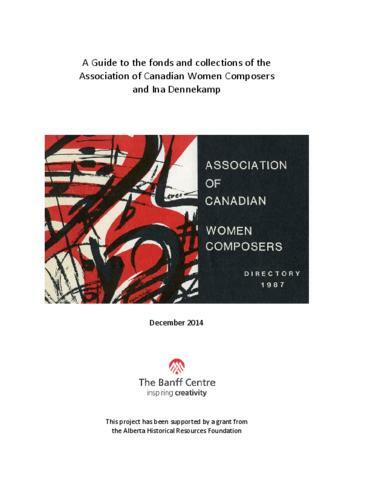 They document the activities and contributions of women composers in Canada and elsewhere. Records consist of two series: Composer Files containing materials that relate to a single composer subject, and Other Materials containing records that relate either to multiple composers or to the subject of women composers more generally.